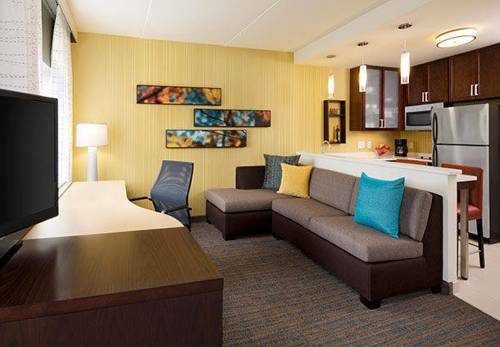 Welcome to our brand new Residence Inn hotel located near the Hudson Valley Mall & Bard College. Full kitchens in every room make our hotel perfect for a weekend away at Hunter Mountain or Belleayre Ski Center. This Marriott hotel offers a convenient location near the Hudson River and nearby attractions. Guests will find a short drive to local attractions like the Horse Show in the Sun. Whether you are traveling for business or leisure, our extended-stay hotel is your ideal destination while visiting Kingston, NY. Business travelers can utilize our business center, free WiFi, and on-site laundry. In addition, our hotel offers a 20-30 person meeting space for your next event. Families will love our complimentary breakfast buffet, or you can prepare meals in your very own in-suite kitchens. Relax and unwind after exploring Kingston in our indoor pool and hot tub area, or squeeze in a workout at our 24-hour fitness center. Our pet-friendly hotel makes sure you can keep the whole family together. Where the pumpkin head got hurled at Ichabod Crane.